The start of the World Cup season is a bit like a trial by fire. After a long off-season, it’s almost like you have to relearn how to handle the chaos and excitement of the circuit. The season has ramped up in North America with stops in Killington, Vermont and Lake Louise, Canada. We’re now officially in the part of winter where the racing is nonstop, which is great news for this podcast because we have a lot to talk about. Instead of just hearing from one guest in this episode, you’re going to hear from some of the best athletes in the sport including Mikaela Shiffrin, Tina Weirather, Lindsey Vonn and Cornelia Huetter — from post race interviews at the latest World Cup races. [00:00:00] Hello everyone and welcome to the sixth episode of The Inside line. I’m your host Gabby Hall, Digital Content Editor for Ski Racing Media. I’m so excited to be back with you guys. If you’re a regular listener you know that our amazing sponsored Team Ski Safe is just the perfect gift for anyone this holiday season. I just got my bracelet pink band of the silver clasp and his team say bracelets are great for anyone involved in action sports like skiing because they make it easier for first responders to treat you effectively in the event of an emergency. You know I have my emergency contact information engraved on my bracelet. So shout out to my mom and the unique ID bracelet on. The unique ID on my bracelet gives first responders access to important medical information. I have loaded into teams a system so team ski safe is the official medical bracelet of not only this show but with sports. And you can find more information about the bracelet and the great range of colors and styles by visiting their website at www.teamskisafe.com and when you order your bracelet remember to mention The Inside line. [00:01:09] So we’re going to dive right into everything that’s gone down in the last couple of weeks. You know technically the world’s Cup season has been here for over a month but it really started in earnest around Thanksgiving. It’s been nonstop since then we had Killington we had Lake Louise and we have a lot to break down about those venues. I’m going to be honest with you. 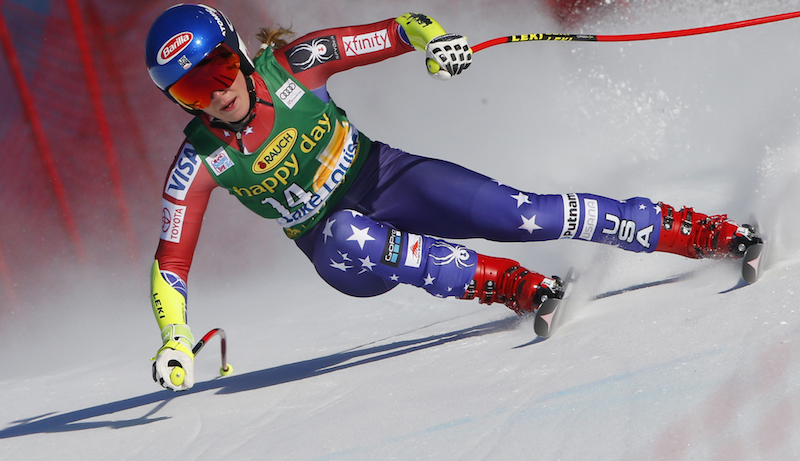 You’re going to hear one name a lot in this episode Mikaela Shiffrin. She has had a hell of a couple of weeks it’s been really incredible to watch. So we’re going to dive right into that and we’re going to start with her story at Killington so there were roughly 34000 spectators at the Vermont venue Thanksgiving weekend. And you know you can take that with a grain of salt. I mean PR tends to paint a very rosy picture of how many attendees there were you know that said it wasn’t incredibly well attended event. It definitely felt busier than last year were they estimated around 30000 spectators. So I definitely think there was an increase from last season and it was just like last year an amazing audience. [00:02:14] There was two days of women’s races slalom and giant slalom and before the races even kicked off there was a press conference with a few U.S. athletes including Resi Stiegler. Now we had a great episode with her episode 5. So if you guys haven’t listen to that definitely go take a listen and get to know racy. But what we’re going to talk about Mikaela Shiffrin and this press conference where we actually have special guest Sofia Goggia of Italy and it was great to kind of kick off the event that way and get a sense of how they were feeling. You know I don’t want to speak for Mikaila Schiffrin obviously but I think that Killington is one of the most high pressure races for her because it’s a home race I mean a lot of her family was there including her now famous Nana who you’ve probably seen. And and on top of that it was a press palooza I mean easily one of the busiest press areas. I’m in all year. And everyone wants access to her. So while at the press conference I asked McHale and Sophia you know how they’re handling the pressure of the Olympic season and these demands that are being put on them by media and sponsors have access to them. And it was interesting because they both started off their answer saying this was a topic they had actually been discussing. [00:03:27] You know earlier in the week so it’s something that’s come up for them and I think Sofia expressed it in a really great way she said they who is presumably you know press and sponsors and fans you know want us she said they want us to be at a level of their expectations. And she also continued to say that you have to remember that you know before being a skier you know there they’re just 20 something girls. I mean they’re both in their early 20s. And they have to deliberately make space in their private lives to be normal people. Sofia Goggia said in the press conference you know you want the Schiffrin and the Goggia and before this we are Mikaela and Sofia. And we exist before the skiers. And so she she really made a great point about saying that you know while the press sort of defines them as these these World Cup skiers and World Cup winners. There’s so much more to the person off of the slopes and outside of the Alpine World Cup circuit. So I just thought it was an interesting way to go to presented that situation and it definitely sounds like they make a big effort to compartmentalize their lives to make everything fit. I think you’d have to particularly in an Olympic season because it’s not just people like me who cover the sport year round and you know outside of Olympic seasons that want to talk to them this year it’s everyone. It’s the New Yorker. You may have seen the Mikaela show for an article that came out from them. You know it’s USA Today it’s the Boston Globe it’s the New York Times. And so there’s just this incredible demand on those athletes to do interviews and give up so much of themselves. And you know at the end of the day they still have to train they have to race and they fail to perform at an elite level. [00:05:11] And so understandably that gets that can get very hard to balance and there you know there’s a reason he can’t always get access to these athletes. And I don’t mean to bore you guys with this information but I’ll tell you this because I think it’s important to humanize these ladies. You know they aren’t robotic. They are just athletes, they are people. And so I just wanted to kind of share what they had to say about that. I don’t want to get too far away from our race coverage so I’m going to refocus on the Killington but I just kind of wanted to share those that kind of interesting note from the first press conference. So racing kicked off with the giant slalom Victoria Rebensburg of Germany Germany took her second one of the season Mikaela Shiffrin got second place which was really pleasing for the hometown crowd. And Manuel Moelgg of Italy took third. It was actually nearly an identical podium to Sölden except Tessa Worley of France was on the podium and sold that instead of Schiffrin. But you know it’s good to see those girls skiing consistently well I think Manuela Moelgg particularly in particular is an interesting one to watch because she is an older athlete. I believe I said that on the last episode but she’s one of the older athletes on the circuit and she’s really having a resurgence. I just think keep an eye on her. [00:06:26] And I’m hoping to talk with her a little bit about how the young athletes that she’s training with are pushing her and helping her kind of comeback not come back a little bit but experience a little bit of a rebirth and get kind of reinvigorated as an athlete. And then the second day I think is the big story. That was the slalom and Shiffrin was looking to defend her win from the 2016 slalom which she did. She did it in flying colors. She won by over a second and a half. A true shift win style. I don’t know if you guys read my my coverage from the event but Mikaela Schiffrin when is the headline I used last year. So use it again this year. So it’s fun. I think it’s it’s one of my better headlines. But you know being at the race when Mikaela Shiffrin wins is truly insane. I mean the crowd gets so loud you can barely hear yourself think over like the screaming and the bells ringing and everything that’s going on in everyone’s eyes are glued to the Hill and the monitors. And it reminds me a lot of the big crowd at soldan or flawed or other big world cups that I’ve been to. I mean everyone’s not so excited for Mikael Schiffrin because a race in the U.S. but just the the level of excitement and passion for the sport is really incredible. You know the intensity is palpable and it didn’t just feel this way for me. What I want to do is play for you what McKayla had to say about the press conference over at the press conference over the weekend about how incredible these East Coast fans are. We all know eco thieves are just incredible and so cool that we were having. [00:08:09] Having World Cups here now in the last year in the season. Last year everybody was sort of surprised how big it was showing there was how loud the crowd was this year everybody’s affected it but it’s still such a nice feeling for specially for me to come to finish. And I can hear everybody screaming and they’re just so supportive. And I actually got a message on Instagram from a girl who said like. You we’re not here to watch you when we just we just. We’re here to support you. We’re just here to watch you racing we’re so excited so I hope you don’t feel pressure from us and. [00:08:46] Read this negatively. That made me feel so much better. So to feel out there were ready direct messages. I do read them. Thank you. And just having the realization that it’s not about what I do or what I don’t do but. [00:09:02] Just sort of sharing excusing with everybody here is incredible. [00:09:07] So like I said Mikaela Shiffrin won the slalom. Petra Vlhova of Slovakia was second just over a second and a half behind her actually. And I think you know as I mentioned when we talked about levy in the last episode there’s going to be this interesting dynamic between predictable Vlhova I think as they as they go for the slalom globe and so it’ll be exciting to see that rivalry play out and then Bernadette Schild earned her third podia or sorry her first podium of the season getting third place. And you know she’s had a lot of good races in the U.S. She had a podium at Squaw Valley last season so the U.S. held a special place in her heart. And I think I think she’s one to watch as well. I just really like her I think she’s a sweetheart. So keep keep an eye on her. She is Marlee shields younger sister so it’s sort of in her blood to do well and I think we’ll see big things from her and the most exciting way to end this segment on killing and destroy you know that it is returning planning to return next year for us to be confirmed with the fist meetings. But they are planning to be back November 23 25th in 2018. So keep your eyes peeled. We want to go next year just you know make a plan. Now Thanksgiving weekend is always tougher travel so you know just keep it on your radar. And those were actually the final tech races for a few weeks I mean we’re in a bit of a break now. [00:10:35] The women don’t get to race the GS until Courchevel and a couple of weeks and the next slalom is inlands after Christmas so we’re kind of in this speed zone right now. And the ladies are going to be headed to St. Moritz this week and before before they do those super G’s they were in Lake Louise this past week and I was actually up there with them. I flew up to Lake Louise which is about two hours west of Calgary in Canada. It’s a pretty remote venue also insanely beautiful if you ever get the opportunity to go. It’s stunning. And if you’re interested in seeing photos I obviously posted a lot of them to Instagram. So go ahead and follow me. I’m going to search for me -Hall_Gabby I should pop up while we were there. There were two downhill races and a Super G and oh my goodness guys so much happened while we were there. There were so many things in fact that I wasn’t sure how it’d take you through the excitement of the weekend. But I think we should start with Lindsey Vonn because she’s so closely associated with this venue. I believe I mentioned this before on the show but Lake Louise is some times called Lake Lindsay because Vonn has had so much success there over the years. She’s had 18 wins 14 in downhill and after the downhill runs. I talked to her a little bit. The training runs and she had this to say about why she thinks this hill has been so good to her over the years. [00:12:03] I’ve had a good feeling hearing you know I think some courses you you show up and you feel a little bit lost and it takes a while to kind of get into it. [00:12:11] But Lake Louise I always you know since I showed up the first time when I was 17 I was like This is my place. You know this is where I can ski well and I just know where I can make speed and where I need to make sure I’m online. And I just have a good understanding for the course. [00:12:27] So you know unfortunately things didn’t play out like she wanted to. She crashed so hard in the first downhill. It was right towards the bottom. She went straight into the b.net and it was brutal I mean the way she tweaked her knee I was very surprised and happy to see her ski down on her own. I did not think it was how it was going to end. And then the next two days of racing the downhill the Super G didn’t seem quite herself on her skis. She was in the top 15 in the second downhill and then she fell in the Super G is just flat out from under her didn’t seem to be a situation with her knee. I did see her checking her skis in the finish area after she slid in the Super G so I’m not sure if that was an equipment related issue or not but. She did seem it didn’t seem like a knee issue necessarily. Now I have no doubt that she’s currently in Europe getting ready for the St Moritz races shaking it all off and getting ready for Super G and she might even be doing her cheese therapy. And it’s not Liz Lemon -the 30 Rock character thing where she is working on her night cheese. I hope some of you understand that reference, it’s one of my favorite shows, but she is actually something she does with her physio to her knee which she explained to me after inspection one day and I think this is a pretty interesting therapy. [00:13:47] I’m just trying to get the swelling down you know definitely my meniscus took a pretty big hit on Friday and after yesterday. [00:13:57] It was a little bit more angry with me. But you know I did some Topfen Therapy; it’s like a cheese in Austria and it puts the ice over it and it kind of. Just sucking the swelling I’ve used it and some injuries in the past. It seems to work pretty well. [00:14:14] So I hope LV is recovering well. Of course I think the real story at Lake Louise was Mikaela Shiffrin who else because she won her first downhill race. And I told you we’d be talking about her a lot in this episode. She’s just really been on a roll lately. So she won on the second day of downhill after earning her first podium the day before. These are actually only her third and fourth World Cup downhill starts of her career she raced the downhills and Lake Louise last season. And the day she won was a very bizarre day because all the electricity went out of the ski area. There was a fire at a power plant substation nearby. And the chairlift just stopped everything shut down. And the timing was rough because it was around 10:00 a.m. local time when all the athletes were headed to inspection. So a ton of them I’m including Lindsay and Mikaela got stuck on a chairlift for close to an hour and they had to bring in the backup power source with chairlifts to run the chairlift long enough to get everyone off and evacuate. It was interesting I was out shooting b roll for NBC when it happened and I caught a video of Ravensbourne being helped off the lift she had just loaded so she wasn’t that far off the ground. She was actually able to hop off instead of waiting for the lift to start running. If you aren’t interested in seeing that video I did tweet it so I’m going to put a link below this podcast. Feel free to go watch that. [00:15:46] So she she got off the lift pretty quickly. But long story short they actually ended up being able to save the race because the generators they use generators to run things like timing and then they use snowcat actually to transport everyone up to the course for inspection and for their race runs. I also tweeted a video of that as it was happening and I’ll put a link to that below the podcast but it was basically like a Snowcat TVR so they had attached ropes to the back of the snowcat with like wood blocks that the athletes could sit on kind of. And it would pull them up behind the snowcat and they would’ve took about 20 minutes to get up. So it’s a long time to be pulled behind the snowcat before the race. But Shiffrin overcame that and won. And I think you know she was stunned of anyone else. I mean she was sitting in the leader box and the camera would panned her and you could tell she was surprised that she was there. But I think you know people who followed her career knew she was capable of this. I don’t know that anyone necessarily thought it would come so soon. But it did. And I think one of the things that played to her advantage was the shortened course because of the power outage. [00:16:56] They lowered the start of the women’s race to the men’s to reduce start and Mikaela’s actually felt like that played to her advantage and I asked her about that in the finish area which I’ll play that clip from now so you can hear what she had to say about about what worked for her to get this win shortening the distance definitely was an advantage towards me because the top section I’m not it’s fine I’m not as good if they’re. [00:17:20] But from where we started them most of the way down it’s fairly technical and I felt really good about that yesterday so I took even a little bit more risk today and it paid off just barely and that was that was really cool. But I also had really good light some of those other girls had fog and it was really dark as well so I mean I definitely know that I was lucky yesterday and today I skied well and I took some risk in that it was really fun and this win once again has brought up the idea of her being a multi event medal threat this year at the Olympics in South Korea. [00:17:55] And Steve Perrino he’s a former ski racing writer, he’s now an NBC analyst you’ve probably seen his face he does a lot of the reporting in the the start area at these World Cups and he tweeted he tweeted this after Mikhaila Shiffrin wom today I kept hearing quote unquote ‘five medal threat for the Olympics in 2018’. But that ain’t right. What about the team event. Question mark hashtag set for 6. So Steve is technically correct. If the U.S. fields a team and Schiffrin is a part of that team for the team event at the Olympics she could win six medals. For those of you who aren’t familiar the team event is a four person squad. They run a parallel panel slalom course and they do it in rounds of elimination and that will be at the Olympics this year so if Shiffrin were to raise the team event the downhill the SuperJail the slalom the giant slalom and the alpine combined. She is technically a six medal threat. But here’s here’s what I want to kind of caveat the savior with because Mikaela has also never podiums in a World Cup Super G. That’s not to say that she can’t or won’t this season. I’m just saying that. As of right now she has never had a medal level finish in that discipline. And above all else I think the chances of walking away with six medals are slim because she herself isn’t even sure she’ll race in more than three or four disciplines. Here’s what she actually had to say about her plans for the Olympic Games and what events she plans to compete in. [00:19:27] It’s not a 100 percent no. I think skiing in five events is maybe a little bit ambitious. You know there’s always a possibility because the speed events come second. So I’ll have and get out of the way. But my prnt charity is still joining saw him and saw him in the combine then the Super G and downhill I mean. [00:19:52] I don’t know I’m not under the impression that like I just go in and wind down maybe on courses where I have a little experience and if I have some luck with the lighting in this in that it can help but I certainly don’t expect to be winning every downhill for me. So. Long story short probably no. [00:20:14] So like I said while I think it’s important to note that there’s potential for six medals. Mikaela seems to be trying pretty hard to keep expectations and her schedule reasonable. I think she has to weigh the risk of getting too exhausted at the games and not being able to finish the World’s Cup season strong. I mean she’s already leading in the overall standings she’s going to be going for her second overall title for the entirety of the season. I mean let’s be honest how much would it stink. She got hurt. Racing the team event at the Olympics and then lost the overall title and she’s going to have a long career. And I think there may be other are there. I think there will be other opportunities for her to be a six medal threat. So I don’t know if she has to necessarily do it this time around. You know she’s a young athlete she’s 22 and she’s she’s got a lot of time to be a six medal threat. And so maybe she maybe it’s for the best that she’s going to focus particularly on tech maybe do superjail by combining and she said downhills kind of fit on her list. And the other big point I want to make is that the U.S. has a really strong and large speed squad this year. I mean Jackie Wiles who was our first ever guest on this show had a fifth place finish in one of the downhills. [00:21:27] And Stacey Cook and Breezy Johnson also had solid results this weekend so I think with the women’s U.S. team being so strong it’s consider the fact that at an Olympic Games they can’t start a people like they did at Lake Louise. The team will be for people and the coaches and everyone will have to decide what makes the most sense and what gives them the best opportunities for winning medals. Because like Tiger Shaw in Killington said; for those we don’t know Tiger Shaw is the CEO of U.S. Ski and Snowboard – you know he said that for an athlete you know the overall title is a big deal but as an organization they are measured on on medal counts at the Olympics so some of those decisions will be made on who has the best opportunity to medal. It made the McKayla Schiffrin but it may also be someone else so I think you just have to consider how many athletes are in play particularly in the speed events. And so now that I’ve given you all my caveats my big conclusion is that you know my approach is always to hope for the best and you always want these spectacular things to happen. But I I keep a healthy level of skepticism always at the back of my mind to keep things realistic. And I can’t and this lake where we segment without talking about the two other winners in Lake Louise Mikaela Shiffrin was not the only one who won Connie Huetter of Austria won the first downhill. And then Tina Weirather won the Super G. On the final day. So Cooter is a she’s a really strong Austrian athlete and this was her first race back after her ACL injury last January. So less than a year. And she comes back and absolutely dominates on super snowy day. [00:23:08] I mean very flat light it was it was a tough win and it was also an emotional went for her I mean her father was there and right before it interviewed her they had a big hug and she was in tears. I mean it was clearly a very emotional moment. So I wanted to share a short clip of our interview afterwards with you guys. We’re in the finish area. You may hear some ambient noise but you know she talked about the wind and having her dad on the road and what that means for her as an athlete you are kind of one year out from an injury and you’re coming back with a win. [00:23:38] What’s going through your head right now. [00:23:40] Really nothing. It’s unbelievable for me because yeah come back it’s something special and that’s come back is I don’t know what should I say. It’s it’s so weird. I don’t know. I was in the starting gate and I was confident but I don’t know it was too it’s fast enough for these girls. So. Today. Tomorrow is a new day. Now I’m super happy and yeah tried to push it again tomorrow. [00:24:12] And I see that your dad is here at the venue. What does it mean to have him here and win in front of him. [00:24:17] It’s nice. I have been here for sure. It’s something specially apart from my home. And that’s good. And we’re talking about different Finsen not only skiing when we stayed three weeks together and all the time is key so it’s good to have another person so to speak and different things. Yeah it’s nice that he’s here. [00:24:39] And then after Connie one two days later Tina Vire autre won the Super G race and she’s from Liechtenstein and she’s such a sweetheart. You know really all these ladies are you’ll probably hear me say that a lot this season. I just I really enjoy talking to them and celebrating their successes. It’s very cool. So she’s from a small country. No surprise. So it’s a small team. And she actually trains with the Swiss team and so I was curious about her relationship with a Swiss athletes and particularly Laura GEW who is second that day actually and Tina had some interesting things to say about her own competition style and why she actually doesn’t like competing against people. [00:25:19] And I’ve always wondered you and Lara seem like pretty good friends. What’s your relationship like. [00:25:23] Well for sure competitors and we we like those battles because like the last two years she was beating me back up 200 today. I have like hundreds and I’m sure we’re both like really. We both want to be faster. But also we can lose you know. And then when you’re a couple hundred back before you a bit mad at yourself and then you really congratulate her from the heart. And I think it’s very important to have those like natural and honest competitors. [00:26:06] And while your competitors. I mean is it nice to have friends on the circuit. Liechtenstein doesn’t have a large team so I know you’re relatively close to the Swiss team. Yes I know the Swiss. [00:26:16] And I have really good friends not just from my team and also from other teams and that’s really important because we’re on the road for so many days a year that you would be sold only if you wouldn’t have friends. And also I’m not the person who is more like in competition with others but more with my South because I used to play tennis when I was younger and I always hated to play against someone and like play the shots that the other ones the other one didn’t like. And I always preferred skiing where I could have my battle with the hill and then in the finish. See how fast the other was but I don’t have to fight anyone else. [00:27:02] So unfortunately I have to close Alba’s episode with a little bit of bad news. I mean having to report on injuries but Marie-Michelle Gagnon on who was previously a guest on the show. One of our early episodes she crashed and the training runs at Lake Louise and at first they didn’t think the injuries were so bad she had dislocated her shoulder which is a recurring injury for her and sort of the the funny story going around the time was that she actually popped it back in her self before the medical team could attend to her and they said and the team captains the medical records said that she was approached by the medical staff and she said one second and she like popped her shoulder back. She did have them various like lacerations minor cuts and bruises. But they didn’t think it was a season ending injury. And then in the days after she felt like something was wrong she got the MRI and found out she tore ACL. So that’s a season ending injury which is a huge bummer. You may remember from the episode where I interviewed her she was really focused on alpine combined this year it’s where she had the most potential to to grab an Olympic medal. So yeah it’s just an all around bummer another injury on the world’s cup. I hope she gets well soon and I can’t wait to see her back on the circuit. And that is all over news for this week guys. I hope you’ve enjoyed this episode we tried something a little bit different to tell you guys a little bit more of a story. [00:28:26] Not one big interview but I promise we’ll be back with some big interviews as the season proceeds. If you guys are loving this podcast please leave a five star review of sports radio on iTunes. I also welcome any ideas for guests or issues you’d like to see discussed on this podcast. Feel free to leave a comment below tweet me at Hall underscore Gabie. Find me on Facebook. I am totally open to suggestions. More episodes of the inside line can be found at sports.com. Scary thing dotcom and just about anywhere you list of podcasts including iTunes, the Google Play store TuneIn, Stitcher, Spotify. Just search for WiSP Sports Radio with over 700 episodes across 30 unique shows and a global audience of one point five million WiSP Sports Radio is the world’s largest network of podcast for women and sports. [00:29:21] I’m going to be back in two weeks time after I’ve done a few more trips. I’m going to be headed to Val d’Isere there and Courchevel the next couple of weeks. The ladies are racing in St. Moritz. We are going to have a lot to talk about in the next episode and I think we’re going to have some exciting guests which I can’t share with you now. But I promise we’ll tease them on social as soon as they’re confirmed. Thank you so much for tuning in guys and I will talk to you in a couple of weeks.